Don’t Ignore Your Cough. It May Be Trying to Tell You Something! Having a cough is so commonplace that most of us view one as more of an annoyance than anything. After all, its causes – such as having a cold or being in a smoky room – are usually pretty obvious, and a cough almost always goes away on its own within a few days. As such, we usually treat it similar to the way we would treat a sneeze or a headache. So basically other than some hot tea, cold medicine (if we know we have a cold) or throat lozenges, we really don’t do much to care for a cough. And, for most coughs, this is really about all the attention they deserve. But what if a cough could open a window into our health by letting us know something more may be going on in our bodies and that we should see a doctor? As it turns out, the “common cough” may not always be so common. And being proactive about our health means knowing more and doing more about our coughs, other than just covering our mouths and nose when we cough. Finally, she got her true diagnosis. It was bronchiectasis, a chronic lung condition that may cause difficulty breathing. So coughing may be cueing you to look into your health, even if your doctor says it’s nothing to be concerned about. A good place to start is knowing what a cough is and about the different types of coughs and their causes. Coughing can either be a reflexive or voluntary (think about when you purposely cough to get someone’s attention) action. In either case, a cough helps protect our respiratory system by getting rid of excessive secretions, foreign materials, fluids and irritants from our airways. It is one of our bodies’ first lines of defense in protecting our health. To achieve its goal, a cough can be so forceful that the air it expels can approach a velocity of 500 miles per hour! There are three general types of cough and they are categorized by how long you have them. An acute cough, as its name suggests, lasts less than three weeks and usually accompanies a respiratory infection such as a cold, bronchitis, pneumonia, whooping cough or flu. It also could be a sign of a disease known as COPD (chronic obstructive pulmonary disease) or be a reaction to inhaled substances at work, at home and in the environment. A subacute cough hangs around for more than three weeks but fewer than eight. One study found this cough to be the most common cough after getting over an acute respiratory infection such as the common cold. It’s that annoying, lingering cough that sometimes last several weeks after you feel better. The good news is that is usually goes away on its own. A chronic cough is one that you have for more than eight weeks (four weeks in children) and can have a wide variety of causes. These include post-nasal drip, allergies, asthma, environmental contaminants, smoking, gastroesophageal reflux (GERD), several heart conditions, chronic bronchitis, emphysema, side effects from medicines such as those for hypertension and sleep apnea. Many of these causes can be treated or eliminated. 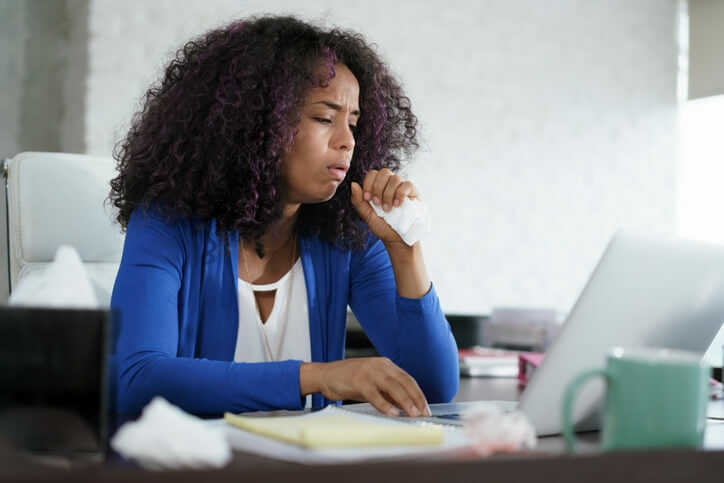 It’s also worth noting that women have a more sensitive cough reflex than men, which gives them a higher chance of developing a chronic cough. Coughs can be further defined by whether they are productive, dry or nocturnal. A productive cough is one that helps break up and bring up (so the body can expel) phlegm or mucus. This is the type most of us have when we are getting over a cold. The second is a dry cough, which is what we usually experience at the tail end of a cold or what smokers experience. The third common type of cough is a nocturnal cough, which is one that we have only during the night. There is another type of cough called a hemoptysis cough, which is one where we cough up blood (if this happens, get to a doctor immediately). You should call 911 or get to the ER if you have severe difficulty breathing, shortness of breath, are coughing up blood, have hives or facial swelling or have any kind of chest pain. If your physician or other healthcare provider minimizes the importance of your cough, listen to your body and stand your ground even if that means getting a second or even third opinion. This is the only way you will be certain that your cough is not a symptom of something more serious, such as heart failure or lung cancer. Such a situation recently happened in Las Vegas when a 27-year-old woman’s persistent cough was allegedly dismissed first as allergies, then as a cold and then as bronchitis. She was eventually diagnosed with cancer. When she was asked about this, she responded that she didn’t feel confident asking her doctor questions and just went along with what she was told. Don’t let this happen to you. Honey or a homemade tea of honey and lemon will work wonders on making your throat feel less raw while possibly helping to reduce your cough. Drink lots of water to thin the mucus. Avoid tobacco smoke and use. Having a persistent smoker’s cough is a great reason to quit smoking if you still do so! There are situations, however, such as with a dry cough, where your doctor may prescribe a cough suppressant to make you more comfortable. You also may be prescribed an expectorant, which helps break up and bring up mucus from your lungs and respiratory tract. If you are directed to take a prescription or over-the-counter medicine, make sure to follow your doctor’s directions carefully. If your doctor determines that you have GERD and that this is contributing to your cough, there are nutritional and lifestyle steps you can take to improve your digestive health. You can find some of the proactive tips here on the pH Labs website.